Morris said the wide receivers need to compete for balls and help Freeman in the passing game. There needs to be more physical awareness and competition in practice between the wideouts, according to Morris. Taking a page out of Olivia Newton John’s book could work in Tampa Bay’s favor and help the 15th- rated pass attack get back in gear. Freeman (2,174 yards, 9 TD, 13 INT) has thrown seven interceptions to four touchdown passes during the three-game losing streak and still believes he’s having a better year than last regardless of the numbers. Whether it’s a case of denial, Freeman must do better with what he has and right now Mike Williams, Preston Parker and Kellen Winslow haven’t done much lately to bail their quarterback out. Williams (406 yards, TD) hasn’t sniffed the end zone since Week 1 and is going through a tremendous sophomore slump. He has a team-best 39 catches. Winslow (344 yards, 2 TD) is second with 38 receptions for the Bucs, who are 16th in total yards with 331.0 per game. Parker (383 yards) leads the team with three TD catches. LeGarrette Blount (434 yards, 3 TD) heads the 25th rushing attack and hasn’t scored since a Week 4 win over Indianapolis. The Packers can count on the Bucs trying to expose their 31st-rated pass defense and allowed 162 yards through the air to the Vikings. Before Freeman can get comfortable in the pocket, Capers will most likely keep the same gameplan as last week and send more guys up the middle, including Matthews (28 tackles, 5 sacks), who recorded 13.5 sacks a year ago. Linebacker Desmond Bishop (84 tackles, 5 sacks) leads the team in stops and is tied with Matthews for the team lead in sacks. Bishop posted one in the win over Minnesota against a mobile Ponder, and should have an easier time getting to the slow- footed Freeman on Sunday. A.J. Hawk (48 tackles, 2 sacks) is another stud linebacker for Green Bay, which is 28th in the NFL in yards allowed, giving up 384.8 per game. Interceptions have been easy to come by for the Packers and Freeman has thrown a lot of those lately. Woodson (42 tackles) leads the secondary with five, while safety Charlie Peprah (44 tackles) is second with four and free safety Morgan Burnett (57 tackles) has two picks. Cornerbacks Sam Shields (27 tackles) and Tramon Williams (27 tackles) each have two INT. Rodgers is playing out of this world right now and is on pace to threaten Tom Brady’s single-season touchdown mark of 50 set back in 2007. Rodgers (2,869 yards, 28 TD, 3 INT) is first in the NFL in quarterback rating (130.7), touchdown passes and completion percentage (72.9), and has thrown four TD passes in each of his last two games. He has tossed no less than two TD strikes in each game and is the first player in league history to record a rating of 110 or better in nine straight games in a single season for the Packers, who are first with 35.6 points per game, third with 306.9 passing yards per game and fourth with 409.7 yards a contest. Rodgers hasn’t been picked off in three straight weeks, but hasn’t hit the 300-yard passing mark in back-to-back outings. It will be a short week after dismantling Minnesota with the second 45-point performance in as many games. Greg Jennings (755 yards, 7 TD) and Jordy Nelson (633 yards, 7 TD) are Green Bay’s deep threats and can spread the field, opening the underneath for tight end Jermichael Finley (445 yards, 5 TD). James Starks (503 yards, TD) could use a boost in the Packers’ 21st-ranked ground game and may get one against Tampa’s meager run defense. Starks is averaging 68 rushing yards over the past three weeks. The Buccaneers could be in for a long afternoon if they fail to prepare for this week’s showdown between old foes. The Packers have one of the top offenses the league has seen in years, while Tampa Bay’s defense hasn’t been as sharp as Morris and the rest of the coaching staff would like. Cornerback Ronde Barber (45 tackles, 2 INT) is a vocal leader and was praised by Morris for his passion in trying to figure out what’s going wrong. Barber has a busy day ahead of him against Green Bay’s playmakers, starting with Jennings, Nelson and Finley. Aqib Talib (28 tackles, INT) plays the opposite side of Barber on the left and is in for a big day as well. Texans QB Matt Schaub was able to pass for 242 yards and two scores last week on an injured foot and Rodgers enters this game with a clean bill of health. 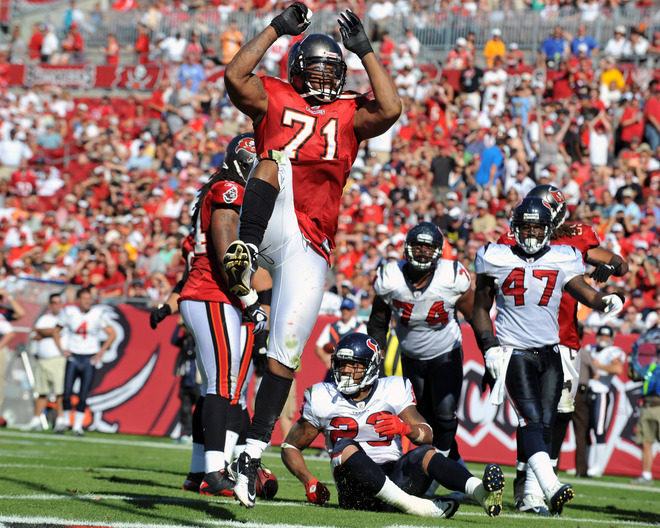 Bucs defensive end George Johnson (2 tackles) suffered a knee injury Sunday and did not return, forcing the team to bring back DT John McCargo, who was cut when Albert Haynesworth signed last week. Haynesworth made five stops in his debut for Tampa, which is 28th against the pass, 29th in rush defense and 31st in yards allowed (401.2). Morris enjoyed Haynesworth’s energy and said he was a spark to the defensive line. He’ll need him to apply pressure again this week. Nothing beats playing in your own backyard. The Packers have averaged a league-best 40.0 points per game at home this season and are off to their first 4-0 start at home since 2002, when they went 8-0 at Lambeau. One of only three teams with an unblemished record as the host, Green Bay has an excellent shot at continuing that trend with a shaky Bucs on the docket. Will Morris’ padded practices pay off against the Packers? Who knows, but it’s a great way to get back to basics and work on consistency. Freeman said he had trouble executing against Houston’s man coverage and will prepare each week the same regardless of who’s next on the schedule. He may not want to overlook a Packers team that can jump out to a double-digit lead in minutes. The odds of the Buccaneers coming out on top are stacked against them. They won their last visit to Lambeau Field in 2005, snapping a 13-game road losing streak. Tampa Bay’s last win prior to that monumental victory was in 1989.